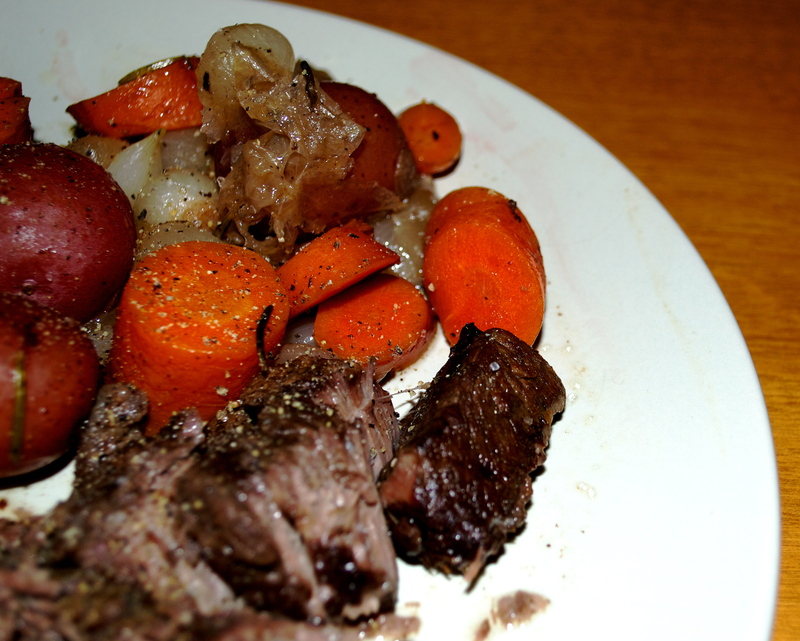 I guarantee this pot roast will melt in your mouth. When running low on time or when making this in the middle of the week, I use my slow cooker. BUUUUT, on a lazy Sunday afternoon, I love cooking it slooooooowly in my dutch oven. For a 3 pound roast, it will usually take 2.5 to 3 hours in a 200 to 225F oven. If you are cooking for a bigger crowd, go for a 5 pounder, but it will take 4 hours, at least. The big problem is having a house smell THIS TASTY and having to wait for the dang thing to finish. But honestly, this is one of the easiest and most impressive meals to make. Start with a good roast, grass-fed if possible. It really does make a difference and it’s better for you and Mr Cow. I usually use chuck roast, but arm roast or shoulder roast work as well. 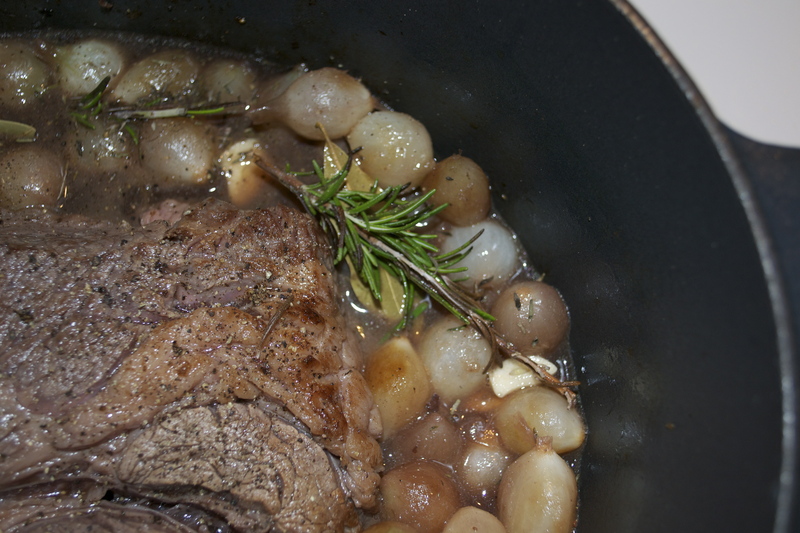 The chuck roast has more marbling which does best when slow cooked, making it good and tender. 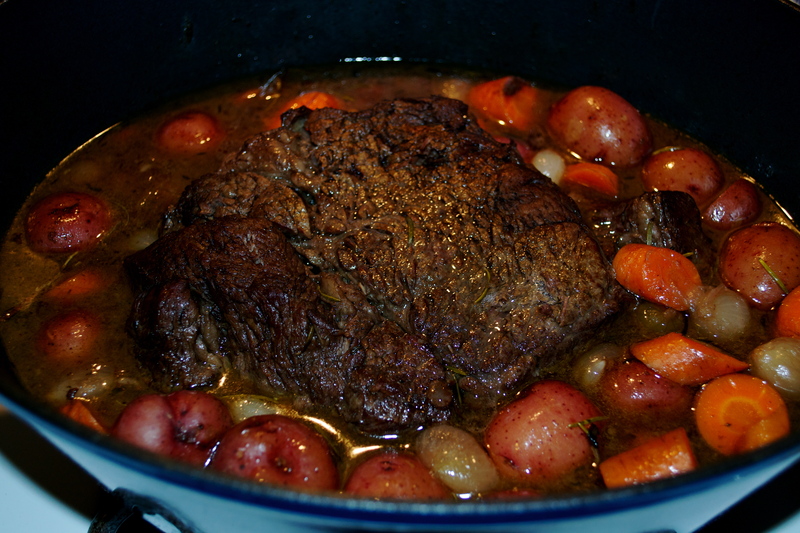 Prior to placing in the oven, brown it on all sides in the dutch oven over med-high heat. This seals in the juices and gives extra flavor. Now when it comes to veggies in my roast, there are many ways to do this. I’m a big fan of onions, carrots, and red potatoes. Personally, I only cook onions with the meat because I hate mushy carrots and mealy potatoes. I add the potatoes and carrots with about 1 hr to 30 minutes left in the cook cycle. OR, I will roast them separately, allowing them to caramelize in a roasting pan…mmmmm!!!! PREP: Preheat oven to 200 F. Place rack in the bottom third of the oven. You may have to remove the top rack if you have a tiny oven like ME. Wash and pat dry the roast. Sprinkle with salt and pepper LIBERALLY…aaaaaall over. COOK: Add about 1 Tbsp of olive oil to your dutch oven. Heat over medium heat until the oil is hot, but not sizzling. Add onions and brown for 5 minutes. Remove onions and set aside. Keep dutch oven over medium heat. Add another tablespoon of olive oil. Add roast and brown on all sides. Once meat is browned on all sides, turn off heat. Add onions and garlic back to dutch oven. 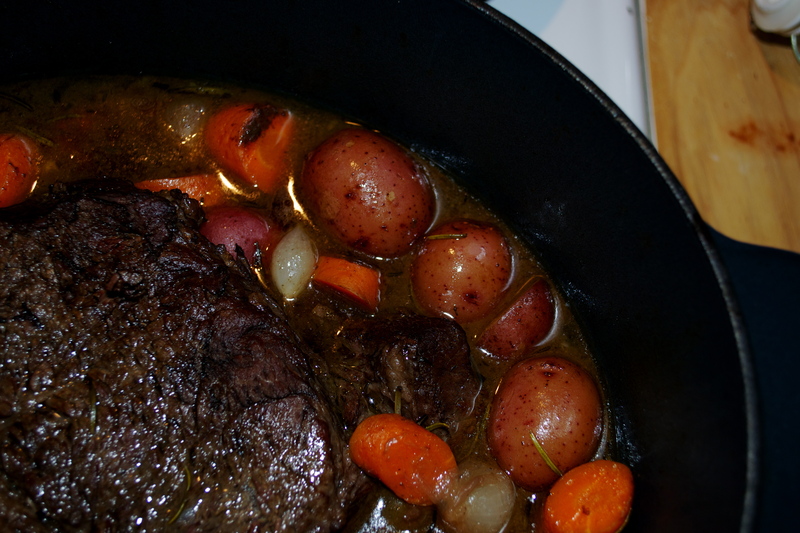 Pour wine over roast and into dutch oven. Because the pot is hot, a majority of the wine will cook down, leaving approximately 1/4 cup left. Add the herbs and beef broth, making sure the herbs are submerged in the broth. Make sure the onions are placed around the roast or underneath the roast. Place lid on dutch oven. Set into the oven on the bottom rack. Set your timer for 2.5 hours. NOW STEP AWAY FROM THE OVEN…..and enjoy that awesome aroma. With about 45 minutes left in the cook cycle, add diced carrots and potatoes directly to the dutch oven. Seal back up…and step away.